Apple will soon be free to move into a high-profile space in Paris that's expected to become home to the company's first retail store in France. 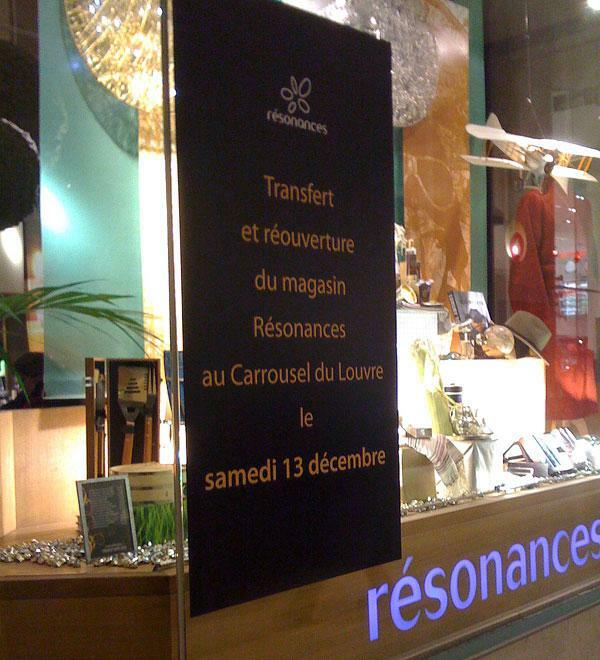 Construction on the store may begin after December 13th, when the existing Résonances retailer at the Carrousel du Louvre underground shopping mall vacates its space and moves to another location in the mall. A large poster has appeared on the front of the store to announce the retailer's move, and attendants at the shop reportedly confirm the Mac maker to be the new lessee. The Carrousel is adjacent to the main entrance for the famous Louvre Museum, which hosts over 8 million visitors a year. It's also one of the few shopping venues in the country allowed to be open on Sundays. The future Apple store will reportedly occupy 7,700 s.f. on two levels at the Carrousel, in spaces #15 and #33 beneath the iconic glass pyramid entrance. Construction on the Apple store could be extensive, including a glass staircase to connect the two now-separate spaces. The store, which could open by Fall 2009, would come two years after informal estimates by chief executive Steve Jobs. Several years ago, he told a shopper at the Apple Store Regent Street in London that Apple would open its first retail store in France "in 2007."